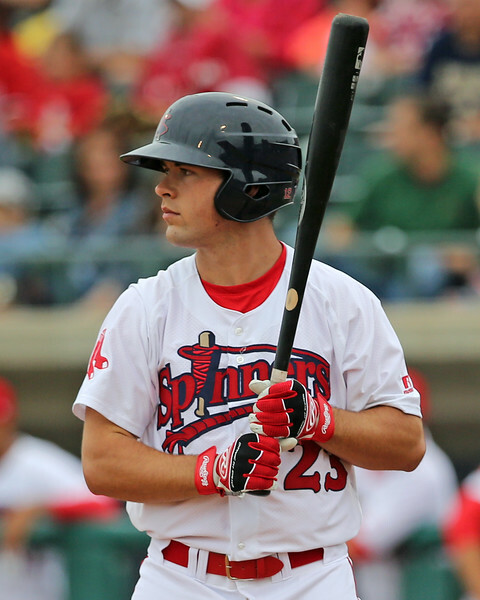 Though Michael Chavis’ promotion to Portland on June 22 got most the attention, infielder Chad De La Guerra also got a call up that day after an impressive half season in Salem where he put up a .294/.368/.463 line with five home runs. Since his promotion, De La Guerra has continued to hit, slashing .315/.394/.489 with three more home runs over 105 plate appearances. Interestingly, along with the improved offensive production, De La Guerra primarily has played shortstop in 2017. Over his first two seasons in the organization, De La Guerra played mostly second base, appearing in only 11 games at short. Unfortunately, in the game I saw, De La Guerra played second base. At second, De La Guerra made all the routine plays, but was a little stiff and vertical when fielding ground balls. He showed average range, more to his glove side than up the middle. He did look a little tentative, preferring to stay back and let the ball get deep rather than attacking it. His arm looked average from second base, but I didn’t get enough of a look to say whether it could play on the left side of the infield. At the plate, De La Guerra starts with a vertical stance from the left side with his hands high. He utilizes a leg lift and showed advanced knowledge of the strike zone. He showed an all-fields approach, driving a double down the left field line in his first at-bat, another double to left center his second at-bat and a single to right field in his third at-bat. De La Guerra showed solid feel for hit and kept the barrel in the zone late. He was confident attacking fastballs and stayed within himself with a short, compact swing. De La Guerra has an average frame with minimal projection. He doesn’t project to hit for much power, but if he continues to show solid contact skills and that he can play a passable shortstop (and maybe even third base), he can become intriguing as a solid organizational player and potentially a utility player. After a strong start to the 2017 season in Salem, left-hander Bobby Poyner was promoted to Portland on June 2, and his stats have been even better in Double-A. In 26 innings with the Sea Dogs, Poyner has an 0.35 ERA and 0.58 WHIP, having allowed only one earned run and ten hits while walking five and striking out 34. The numbers jump off the page, so I wanted to get a look at what has helped the 24-year-old achieve this success. Poyner is undersized with a mature frame, listed at 6-foot-0, 205 pounds. He has a well-developed lower half with minimal remaining projection. Though Poyner’s stats are impressive, his stuff doesn’t stand out; he gets outs through deception and commanding the strike zone. Poyner throws from a three-quarters arm slot from the first base side of the rubber. He has a funky leg kick, bringing his leg high and then kicking it out sideways before coming to the plate. He has a short arm action and keeps the ball hidden behind his body so hitters don’t pick the ball up until late. 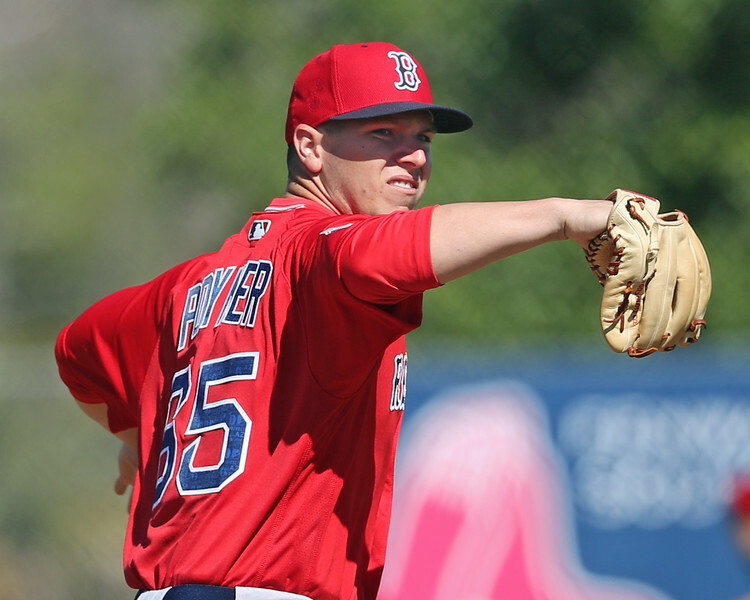 Poyner’s fastball jumps on hitters even though his velocity is only average at 89-90 mph. He showed advanced control of the offering when I saw him and got ahead of five of the six hitters he faced with fastballs. Poyner’s best secondary pitch in the outing I saw was his 76-80 mph changeup. He throws the pitch with deceptive arm speed and good separation from his fastball. The pitch shows drop and fade, and he has advanced feel for it. He’ll throw the pitch in any count and it showed the ability to miss bats. Poyner also showed a 78-80 mph curveball. The pitch lacked tilt and showed short, vertical movement. He did hang one up to a left-hander that was subsequently hit out of the park. Poyner doesn’t have a high ceiling, projecting as a situational reliever at best. The bar for left-handed relievers in the major leagues is low, especially one who can get both left and right-handed hitters out as Poyner has. What Poyner does isn’t flashy, and his .179 BABIP in Portland shows that some regression is coming, but if he continues to show the ability to get hitters out, he could force the issue and play his way into the Red Sox bullpen picture at some point in 2018.